* MEMBERS: Have you updated your email address with us? What Did Rabbie Really Look Like? There has been much speculation about the cause of Robert Burns's death. The responsibility for this probably lies with Burns's first biographer, one Dr. James Currie, a Scot who had settled in Liverpool. Currie was reportedly a bit prudish and frowned upon the stories he had heard about Burns as a drinker and womaniser. Perhaps he put two and two together to make five but he suggested that Burns death was as the result of alcoholic excess and even alluded to venereal disease as being a contributory factor. As a result of this later writers seized on this aspect of Burns's reputation. Poetic licence was used and soon Burns's had died from a hundred different causes. One report even suggests that during January 1796, while in respite from his illness he spent a drunken night in the Globe tavern with his cronies. Leaving the Globe he was so drunk he fell and went to sleep in the snow. This does not stand up to scrutiny. For a start his pals would surely have been looking after him, knowing how ill he had been. Also, this letter to Mrs Dunlop, his muse, on 31 January suggests that he had been lucky to get out of bed that month never mind going to the pub. These many months you have been two packets in my debt--what sin of ignorance I have committed against so highly valued a friend I am utterly at a loss to guess. Alas! Madam, ill can I afford, at this time, to be deprived of any of the small remnant of my pleasures. I have lately drunk deep of the cup of affliction. The autumn robbed me of my only daughter and darling child, and that at a distance too, and so rapidly, as to put it out of my power to pay the last duties to her. I had scarcely begun to recover from that shock, when I became myself the victim of a most severe rheumatic fever, [my emphasis] and long the die spun doubtful; until after many weeks of a sick bed, it seems to have turned up life, and I am beginning to crawl across my room, and once indeed have been before my own door in the street. Note: The "sin of ignorance" to which Burns refers is the fact that Mrs Dunlop had lately been ignoring his letters. Allan Cunningham says in his 1834 book, "Rumours of Burns's political indiscretions and social indecorums seem to have led her to avoid writing to him." She certainly appears to have been quite unforgiving during this period as just a few days before his death he wrote another emotional letter to her. "It was soon spread through Dumfries that Burns had returned from the *Brow much worse than when he went away, and it was added that he was dying. The anxiety of the people, high and low, was very great. I was present and saw it. Wherever two or three were together their talk was of Burns, and of him alone. They spoke of his history, of his person, and of his works - of his witty sayings and sarcastic replies, and of his too early fate with much enthusiasm, and sometimes with deep feeling. All that he had done, and all that he had hoped he would accomplish, were talked of: half-a-dozen of them stopped Dr. Maxwell in the street, and said, "How is Burns sir?" He shook his head, saying, "he cannot be worse, " and passed on to be subjected to similar inquiries farther up the way. I heard one of a group inquire, with much simplicity, "Who do you think will be our poet now?" Though Burns now knew he was dying, his good humour was unruffled, and his wit never forsook him. When he looked up and saw Dr. Maxwell at his bed-side, - "Alas!" he said, "what has brought you here? I am but a poor crow and not worth plucking." He pointed to his pistols, those already mentioned the gift of their maker, Blair of Birmingham, and desired that Maxwell would accept of them, saying they could not be in worthier keeping, and he should have no more need of them. This relieved his proud heart from a sense of obligation. Soon afterwards he saw Gibson, one of his brother-volunteers by the bed-side with tears in his eyes. He smiled and said, - "John, don't let the awkward squad fire over me!" His household presented a melancholy spectacle: the Poet dying; his wife in hourly expectation of being confined: four helpless children wandering from room to room, gazing on their miserable parents and but too little of food or cordial kind to pacify the whole or soothe the sick. 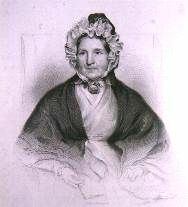 To Jessie Lewars, all who are charmed with the poet's works are much indebted: she acted with the prudence of a sister and the tenderness of a daughter, and kept desolation away, though she could not keep disease. - "A tremor," says Maxwell, "pervaded his frame; his tongue, though often refreshed, became parched; and his mind, when not roused by conversation, sunk into delirium. On the second and third day after his return from the Brow, the fever increased and his strength diminished. On the fourth day, when his attendant, James Maclure held a cordial to his lips, he swallowed it eagerly - rose almost wholly up - spread out his hands - sprang forward nigh the whole length of the bed - fell on his face and expired. He was thirty seven years and seven months old, and of a form and strength which promised long life; but the great and inspired are often cut down in youth while "Villains ripen gray with time". "Why am I loth to leave this earthly scene? Have I so found it full of pleasing charms? Some gleams of sunshine 'mid renewing storms"
So died Robert Burns. I cannot contribute to the speculation that there has been about the cause of his death. From what I have read however, I am happy to agree with those who say that Burns died of bacterial endocarditis secondary to chronic rheumatic heart disease. This is a disease that affects the membrane surrounding the heart and it was possibly the result of having suffered from rheumatic fever as a child. 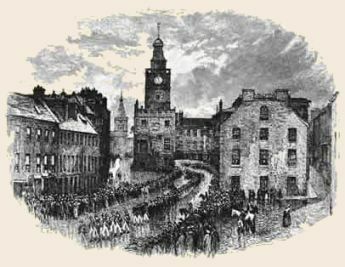 Despite his "awkward squad" request to his brother volunteer Gibson, Burns' funeral was on a grand scale and he was buried with full military honours and thousands lining the streets of Dumfries. At the graveside the firing squad fired three volleys as the dirt was shoveled into the grave. Sadly his brother Gilbert was the only member of his close family who attended the funeral (his wife Jean being in labour with her ninth child). This is an image of the funeral invitation sent out in Burns's son's name. I understand that the original is in the Mitchell Library in Glasgow. *The Brow Well is a little tank that was used as a mineral spring in the Parish of Ruthwell, about 10 miles from Dumfries. Burns had been advised to go there by Dr. Maxwell to drink the foul tasting spring water in the hope that it would alleviate his symptoms. Part of this treatment involved wading neck deep into the cold waters of the Solway Firth. Just the job for someone suffering from a chronic heart complaint!